Vacation rental cabin / bungalow. Sleeps 9, 2 bedrooms, 2 bathrooms. Cats, Dogs allowed. What a beautiful setting by a babbling brook near historic Todd, NC. Soak you cares away in the bubbling hot tub located on the back porch. Relax by the fire and catch up on TV! The beautiful gas fireplace creates a warm and cozy ambiance. The living room and the dine in kitchen are open to each other. Another view of the welcoming living area. The master bedroom offers a comfy queen bed. Relax and watch TV from bed. You are sure to relax in this charming master. The quaintly decorated master bath. The upstairs loft area offers plenty of seating and air hockey. Another view of the loft seating area. Upstairs, you will find another bedroom with twin and double bed. A TV is provided for your viewing enjoyment. This bubbling hot tub is a dream. Enjoy the fire pit on a cool evening by the stream. The front porch offers rocking chairs and a swing for two! The quiet back porch offers the sounds of the creek. Babbling Brook is nestled amidst the trees. 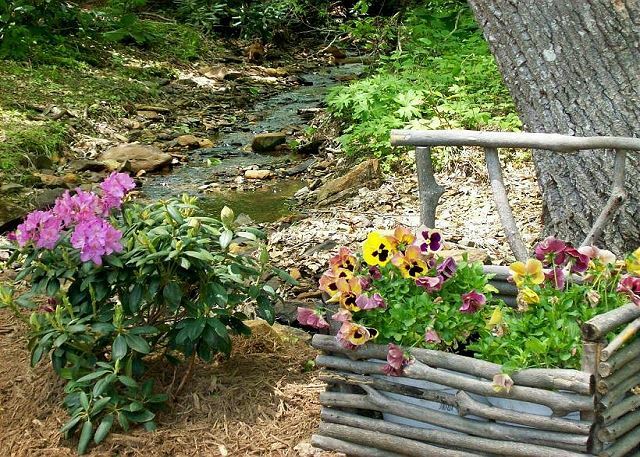 Enjoy the beautiful flowers near the stream. A welcoming sight as you arrive..
A view of Babbling Brook during Autumn. Enjoy the fire pit near the creek. RiverGirl Fishing Company is just a short drive from the cabin. Rent canoes, rafts or bikes. Another view of Rivergirl Fishing Company. Babbling Brook is a Carolina Mountain Properties & Rentals property. Our calendar and rates are updated instantaneously. We strive to make it as easy as possible to stay at one of our properties. We will notify you proactively when an early check in is possible and you’ll receive the comforts of a luxury home when you arrive with a starter supply of paper products, hand soaps and lotions. In addition, we offer 24/7 emergency after hours service. Carolina Mountain Properties & Rentals uses one of the industry’s most trusted brand of software to securely store all guest data. All of our vacation rentals follow local and state tax rules. Each reservation includes applicable taxes, linen cleaning fee, and a processing fee. Carolina Mountain Properties & Rentals also offers an optional trip interruption insurance to protect your investment. Earl B from Monroe, NC does not recommend this vacation rental. The house was nice, everything worked and was very clean. The cabin was easy to find and easy to access. The master bedroom bed was really uncomfortable and the tiny TV may as well not be in the room, as it’s not visible from across the room. It was Valentines weekend and the house was still decorated for Christmas... a little weird. Then there’s the for sale sign out front by the road. We had people knocking on the door wanting to see the house all weekend, one at 7:30 Saturday morning! I would not rent another property “on the market”, you spend your weekend telling people it’s not your house. Thank you for taking the time to leave a review of your recent stay at Babbling Brook. The property is on the market for sale but we do contact guests in advance if there is a requested showing. We were not contacted for a showing the weekend you stayed, and apologize for any inconvenience you may have incurred. In order to prevent further drive-by requests for a showing, we have removed the real estate sign from the property. In addition, we are in the process of updating the bedroom TV to a larger one, and replacing the mattress. We do hope you will stay with us again in the future. Thank you for leaving a review of your stay at Babbling Brook. We are thrilled to hear that you enjoyed your stay. We look forward to having you stay with us again. The cabin was wonderful and just what we were looking for! Very cozy and warm..made us feel right at home! Thank you for taking the time to leave a review of your recent stay at Babbling Brook. This a wonderful home that invites you in from the moment you arrive. We look forward to having you stay with us again. We thoroughly enjoyed our stay. The cabin was well stocked, very clean and the perfect size for us. We enjoyed the privacy in the back and we were able to enjoy the hot tub even in the rain! Beautiful area! We are delighted to hear that you enjoyed your stay at Babbling Brook. This cabin is great for a couple or small family. We look forward to having you stay with us again. Enjoyed our stay. Wish it could have been longer. Very satisfied with cabin and location. Would definitely stay there again. We are delighted to hear that you enjoyed your recent stay at Babbling Brook. We hope you can visit us again for longer stay soon. Thank you for leaving a review of Babbling Brook. This home features a great fire pit by the creek with chairs and a picnic table. River Girl Fishing Co is great for a fun day on the river! We look forward to having you stay with us again. We are delighted to hear that you enjoyed your stay at Babbling Brook. Its in a convenient location between Boone & West Jefferson - great for exploring the High Country. We look forward to having you stay us again. Thank you for taking the time to leave a review of your stay at Babbling Brook. This is definitely a cabin that makes you feel right at home from the moment you arrive and with its convenient location you can still explore. We look forward to having you stay with us again. There was plenty of room for all 7 of us to sleep comfortably. The kitchen was fully stocked. Rules were clear and on the fridge for easy reference. Beds and furniture were comfortable. We loved the fire pit and hot tub and played a few games of air hockey, too. The driveway was easy to navigate, the setting was private, and the cabin was beautifully decorated in a country rustic theme. We would stay here again. We are delighted to hear that you enjoyed your recent stay at Babbling Brook. Our goal is to make sure that our guests have an enjoyable stay and that the cabin feels like it is your home during your stay. The driveway is easily accessible even during the winter months. We look forward to having you stay with us again in the future. Very neat and clean cabin. Great location and plan to treat again soon. We certainly do appreciate you taking the time to leave a review of your stay at Babbling Brook. We look forward to having you stay with us again. Babbling Brook cabin was a great choice for us, this trip. We recently adopted a rescue dog, so I was especially pleased to find a dog-friendly cabin available for the weekend. We are veterans of Carolina Mtn Rentals, but this is the first time we've rented a cabin that ended up being in a neighborhood setting. I wish the description of Babbling Brook had made that more clear, but we still thoroughly enjoyed our stay. The sounds of the water rushing through the creek were divine, and it was wonderful to be so close to both Boone and West Jeff. This cabin is beautifully decorated, well appointed, and perfectly comfortable. We're glad to have had the opportunity to stay here and explore the area around Todd, NC. We are delighted to hear that Babbling Brook was a great choice for you. The home is nestled in a neighborhood but its not you traditional neighborhood with a house on either side. The creek is peaceful and relaxing. We look forward to having you stay with us again. we love it here. so relaxing, nicely kept and homey. cant say enough good things! We are delighted to hear that you enjoyed your stay at Babbling Brook. We look forward to having you stay with us again. My family and I decided to for-go a commercial Christmas and rent a cabin in the mountains and just spend time together. Babbling Brook was a quaint and cozy cabin. It was a little smaller than expected but we made it work. It had everything we needed. We had a couple issues that arose, but, the office and housekeeping staff was quick to address the issue even being the holiday. They were wonderful. I would not hesitate to rent this cabin or from this company again! Thank you for taking the time to leave a review of Babbling Brook. The home is a cozy cabin. We look forward to having you stay with us again. We have stayed at Babbling Brook many times for many years now and have never been disappointed! It is cozy and well-equipped. The fire pit is perfect, and the neighborhood dog ("Pup") ALWAYS comes to greet us when we are out at the fire pit. Highly recommend this place!!! We are thrilled that you love coming back to Babbling Brook. We look forward to having you stay with us again. Only draw back is that the driveway is slanted which makes parking and turning a motorcycle around a bit of a challenge. We are delighted to hear that you enjoyed your recent stay at Babbling Brook. If you have concerns regarding driveway access, we encourage guests to contact us before booking as we can assist in finding the cabin with the right driveway. We look forward to having you stay with us again. My husband and I made a last minute decision to get out of the city for the weekend. I went on the Home Away app, found this perfect little cabin and sent off a note to see if it was available to rent for the weekend. Within 5 minutes I had gotten a call back, had it booked and was jumping in the car to head to the mountains. The cabin was perfect! I have stayed in dozens of cabins over the years and I've never stayed in one so well taken care of. One of my chief complaints when I rent beach houses and cabins is that the kitchen is never well stocked with cooking supplies. It always seems like someone just went to yard sale and bought random stuff. Not at this cabin. It had everything you would need to prepare a Thanksgiving dinner. Everything in the cabin was of good quality...from the appliances which were all clean and worked perfectly to the quality of the towels provided in the bathroom to the sheets on the bed. It was evident that someone took great care to make sure that everything was in its place and ready for guests. Little touches (like how the towels were folded or where the remotes were placed) make so much difference and whoever prepared this cabin for our arrival really understood that. One night we were there we inadvertently locked the keys in the cabin. At 10 o'clock at night we called the emergency number and someone immediately got in the car and met me with a spare key. It could have been a disaster but it ended up being only a short delay in us getting back into the cabin for the night. Every single thing about our experience with this cabin was outstanding. We will DEFINITELY to back!!! We are so thrilled to hear that you enjoyed your recent stay at Babbling Brook. We look forward to having you stay with us again. a guest from St. Johns, Fl does not recommend this vacation rental. Very clean and decorated mountain style. Cabin is 1st one off main road & on the road into the neighborhood. There is a small shallow creek that separates the main road from the property. I would not be comfortable leaving a dog or young children to explore the property by themselves due to the busy roads. The community road is busy with those from the top coming down at a very fast speed then braking hard at the stop sign which is by this cabin. There is another cabin by the same rental company across the street if you need more room. They have done a good job with landscaping trying to keep it private. The master bed needs attention as it sounds like a ton of firecrackers going off when you lay, roll or get up. We did report this & was told someone would check it out. Cabin nicely furnished with most everything you need in the kitchen. Hot tub was fine & fire pit is huge & next to the creek with great chairs. Being a log cabin, it creaks loudly at night. The first night we thought someone was coming down the stairs as it sounded just like it. We did not use the upper level only the main level. There is a double & twin bed plus a loft with a couch. Back deck is secured with a rolling gate. Wish front deck was as well. The front steps are many & steep but back steps not as bad. I don't recommend this cabin for anyone with mobility issues. Gas grill is on the ground level & you must leave the back deck to access. Would be nice if deck could be extended out just enough to allow the grill to be on the same level & covered. We did not use the grill. This cabin would be good for folks with older children who know not to wander onto the roads. Thank you for taking the time to review your recent stay at Babbling Brook. This is a cabin with a metal roof and it does crack and pop when it cools off at night. We will be assessing the master bed to determine what needs to be done. This cabin is in a residential area with some full type residents that go in and out. We hope you will stay with us again and choose another cabin that is more secluded. Great 2 night stay to escape the Charlotte heat! This cabin is charming! It exceeded our expectations in terms of cleanliness as it was definitely rustic but did not have a rustic "scent" to it. It was very fresh - big deal to us. The little brook behind the property added a sweet touch of charm. We used the fire pit one night and greatly enjoyed it. We needed a few supplied and W Jefferson is close enough to be convenient but still far enough for us to fee like we were in the woods. The hot tub was in great working order and was situated so that there was ample privacy from neighbors. All in all it was terrific and we highly recommend it. We are thrilled to hear that you enjoyed your escape from the Charlotte heat at Babbling Brook. 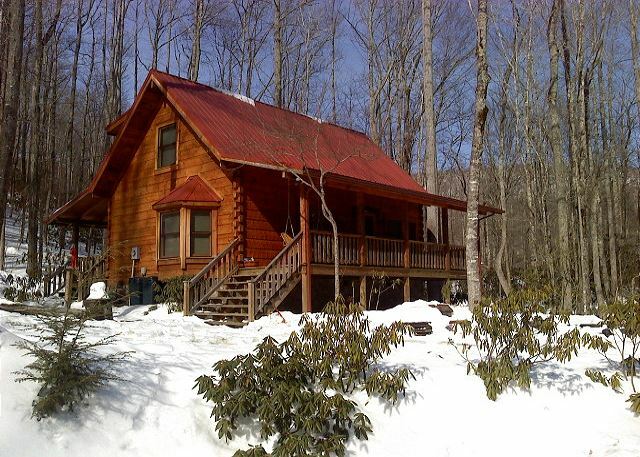 This cabin is located in Todd, NC which is convenient to both West Jefferson and Boone. We hope you can stay with us again. Thank you for taking the time to leave a review of your recent stay. The washer was repaired and is working. We look forward to having you stay with us again. Our family loved this home so much! The atmosphere and layout of the house was perfect for my husband, me, and our two sons. We felt like we could have spent the entire summer there, happily. Thank you for taking the time to leave a review of your recent stay at Babbling Brook. This cabin is lovely. Nicely decorated and comfortable, our family of 5 fit perfectly. The kitchen had everything we needed. The beds were comfy. We did not use the hot tub, but it is on the back deck, private and a nice view. The cabin was clean and everything worked perfectly. The description says it sleeps 9 people, and although that is true, I think that would be way too tight sharing the bathrooms and kitchen, etc. We chose this cabin because of its proximity to Stonebridge, where my Mom has a cabin. It is located just outside of Stonebridge. The manager answered my email question almost immediately, and on the day of check-in called to let me know when the cabin was ready. I would definitely recommend this charming cabin. We'll be back! We are thrilled to hear that you enjoyed your recent stay at "Babbling Brook." Thank you for taking the time to leave a review. We look forward to having you stay with us again! We had a fantastic stay! The home was wonderfully outfitted. Plenty of towels, blankets, etc. Furniture was comfy and cozy. The upstairs bedroom where my children stayed was so comfortable- my 9 year old twins slept in, every day! Kitchen was far better outfitted than our last rental, which had boasted of a 'gourmet' kitchen'. The most pleasant surprise was that the house was IMMACULATE when we arrived. The creek was a nice diversion for my children when my husband and I had to catch up on some work. Location is convenient to lots of great hiking and shopping. We had a lovely trip to Linville Falls, and plenty of the day left for a delicious dinner in Boone. We also enjoyed tons of water activities with Rivergirl Outfitters and with Wahoo Outfitters down the road. We look forward to coming back to the area soon! We had a great time. Plenty of room and the hot tub was fabulous! Loved the cabin, it was nice and cozy with country/rustic decor. Located nicely for what we wanted to do; rise the parkway to some hiking trails and go in to Boone and Blowing Rock to shop and try some new restaurants. jeffery c from sherrills ford, NC does not recommend this vacation rental. First let me say that the folks at Carolina Mountain Properties were wonderful to work with. Everything went very smooth and they even called to let us know we could get in 3 hours early. The inside of the cabin was wonderful, we had everything we needed and it was very clean. The hot tub was wonderful day 1 but by day 2 it looked like used bath water. I don't think the filter was working. The worst part was none of the cabins in this area are private. I could see 6 other cabins from the hot tub. We hiked the whole area and every cabin was the same....cabins all around you. If you don't care about privacy I give this cabin a 4. My wife and I slipped away for a quiet weekend. The cabin we stayed in was perfect size for us and could have accommodated our kids as well. It is very cozy and clean while being close to many attractions in the high country. Perfect weekend getaway! We will stay here again. Precious cabin in the woods!! We loved our visit, very clean and comfortable. We have been coming here to this same cabin about every 6 months or so for the last 8 years, in Spring and Fall to see the beautiful North Carolina leaves changing. This cabin has been consistently a treasure for us and is so cozy and comfortable, especially with the neighborhood welcome dog, Pup! The Babbling Brook next to the cabin by the fire pit is mesmerizing, and the fireplace and hot tub are welcoming and relaxing. Highly recommend. The Babbling Brook cabin was the perfect little getaway! It was easy to find, clean and welcoming, and nicely decorated !! You walk into the front door to a cozy, clean, cabin smell. The master downstairs was very nicely decorated and comfortable ! We would definitely recommend this place to others ! We thoroughly enjoyed our stay at Babbling Brook! Quaint, lovely cabin in a beautiful setting! The cabin was perfect for our party of 5 and two dogs. We loved sitting out on the porches in the rocking chairs. The hot tub was fun! The kitchen is well stocked. We cooked breakfast and one dinner. We visited the farmer's market and the Ashe County Cheese Factory in West Jefferson. The fresco at St.Mary's Episcopal Church was amazing! Very close to Blue Ridge Parkway and ended our trip with a hike at the Cascades. We loved Babbling Brook and would definitely return. The babbling brook was a very nice clean quiet and well kept place. Has a nice little stream beside the cabin to listen to while you're in the hot tub. Could ask for any better. Thoroughly enjoyed our stay. With 2 sons in Boone, we are always looking for a place to stay and this is a great alternative to hotels in the area. What a lovely place to refresh. We will be renting this place again! Babbling Brook was the perfect little cabin for our weekend with the kids. The cabin was cute, clean, and the beds were comfortable. We loved the porches, hot tub and fire pit. Thanks so much! We have been coming here to the same cabin every 6 months for the past 6 years and are never disappointed. Beautiful cabin with great amenities! Charming- if you are looking for a place to rest this is it! Beautiful quaint cabin (with modern amenities) nestled in the woods. We were only there for four nights but managed to enjoy the hot tub, gas grill, fire pit, kitchen and fireplace. There is a couple TV's and cable but we never turned it on... (although we did use the wifi!) We both caught up with much needed rest! This cabin was absolutely wonderful. Location, amenities, and quality were well above expectations. Despite the fact that we had never stayed at this property before it felt like home away from home. Cleanliness and comfort were optimal. The owners of this property have been very gracious with not making this cabin feel like a rental. In the mornings we hiked around the cabin. In the afternoon we spent our time in Boone and other areas in Watauga County, and in the evening we enjoyed the relaxing atmosphere in West Jefferson. After a full day we retired at night at the cabin to enjoy the fire pit and then the hot tub. Overall great experience. Carolina Mountain Properties was very helpful and friendly. Ms. Kelly was very patient and supportive with all of my calls as we were trying to make a decision whether to spend the money or not. In the end I still feel it was a little pricey, but we will try to make room in the budget for another return visit in the future. This cabin is like a dollhouse!! It's adorable. Loved every minute. Hot tub was wonderful. Will be back for sure. Thanks for taking the time to leave your review of Babbling Brook. We are happy to hear that you enjoyed your stay. Thank you for your review. The hot tub was serviced before your arrival. We send a hot tub tech to service the spa when guests are staying longer than 4 days to freshen up the hot tub and make sure the chemical levels are in balance. We certainly hate that this interrupted your stay. This is the cutest cabin we have ever rented! The perfect size for 2 adults and 2 children (with room for more on the pull out couch). It is decorated so cute and is so cozy inside. And CLEAN! The brook and firepit provided hours of entertainment. The Hot tub is sanitized, clean and ready to use. We went to nearby West Jefferson (incredibly easy drive there) one day and Blowing Rock the next day, location made it easy to explore both areas which you don't want to miss! I love the mountains and can't wait to return! Very good, really enjoyed it. Thank you for taking the time to leave a review. We look forward to having you stay with us again in the future. My husband and I have been coming here to the same cabin for the past 6 years or so every 6 months and noted a few issues this time that were new: we called in a little early (1:30-2) to see if we could get the code and they said no, implied the cabin wasn't ready. We hung out and wasted time for a bit, then arrived right at 3 and lo and behold there was no cell service so I had to drive into West Jefferson to even get coverage to get the key code. Wasted about 30 minutes and was quite annoying. Also, once we got into the cabin there was no information on the wifi connect code (which we have had every time in the past) so had to call again and they just repeated the login without indicating which letters were caps, etc, so had to call again and waste even more time to finally get the correct connect code. Also, there was trash around the cabin, on the outside and in the backyard. Having said all the above, we still love this little cabin (and especially neighborhood dog PUP!) and will come back again. I just hope they can resolve some of the above issues. The leaves were beautiful and in full regalia, and the weather was perfect. The fire pit and babbling brook are so soothing you will come here and never want to leave!!! We do apologize for the inconveniences that you experienced during you stay. Unfortunately, the cabin was an 11-3 cleaning the day of your arrival and the cabin was not quite ready when you called for the code. We have made sure that the password for the internet is posted at the cabin and made sure to include it on the directions sheet. Wonderful stay in a very cozy cabin. Thank you for taking the time to review your stay at Babbling Brook. We are thrilled to hear that you enjoyed your stay. We look forward to having you stay with us again in the near future. My family stayed at the cabin for four nights, and it was fantastic. The interior is adorable, and the outside, with the brook that really does babble, was great for my son to explore. It's a bit of a drive to Blowing Rock and Boone, but the upshot is the route is beautiful to drive. And if hadn't been raining for much of it, we definitely would have taken advantage of the fire pit. We are so happy to hear that you enjoyed your stay at Babbling Brook. Sounds like your family made quite a few memories during your time in the mountains. We look forward to having you stay with us again. Really like the surroundings of the cabin including the creek and fire pit. Would have preferred to not have houses directly across the street but still a very private cabin. Was very pleased with the stay. My family loved this little cabin. There was space for all six of us. The cabin was incredibly clean and tidy. The kitchen had everything we needed to prepare dinner and breakfast. The hot tub was perfect and was a highlight! The stream was my favorite. The kids spent a morning playing in the stream and making smores on the fire pit. Close access to the blue ridge parkway and about 30 mins from App State. Have stayed here almost every 6 months in the spring and fall for the past few years and have never been disappointed. Beautifully appointed cabin next to a (yes) babbling brook with an awesome fire pit, hot tub and comfy bed. Got to speak with the owner this time due to a noisy grandfather clock and he couldn't have been nicer - walked us through finding the key to the clock and stopping it. Cabin is always neat & clean, beautiful location and comes with a neighborhood dog named "Pup" that greets us each time we come back!